Check out the goods from my dear Secret Pal!!!!!!!!!!!! This was a great Vday surprise!! I must say, however, that the candy she sent is not pictured. I’m sure you can imagine where it went! So thank you so much, S.P!!!!!! The washcloths are so cute! What a good idea. I haven’t decided what to make out of that yarn but it’s one of my favorite colors!!!! On the knitting front, I have to finish that variegated yarn garter stitch scarf soon. I’m close but not there yet. Maybe this weekend. I have been so busy with school and sick/tired with pregnancy that I just can’t wait until the weekend comes. 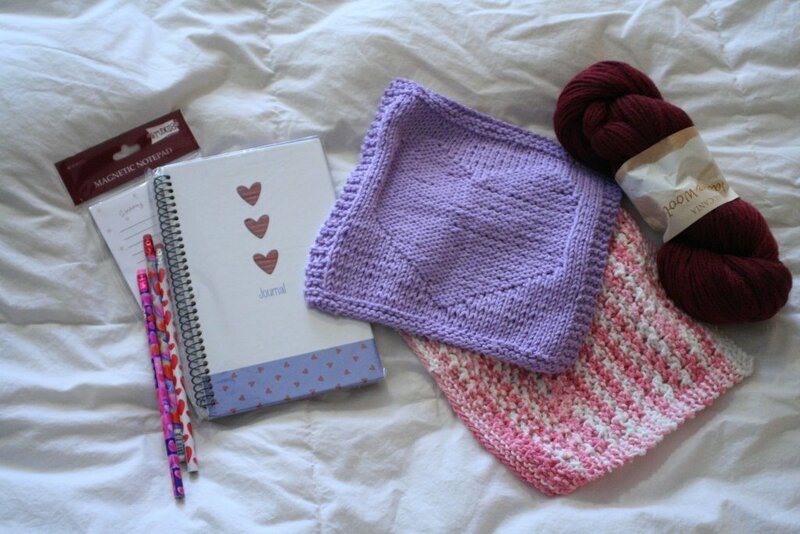 I’m glad to hear from several other bloggers that they weren’t able to knit much while pregnant. I’m sure I will get motivated in the summer!!!! Lots of things to catch up on! First, many many thanks to my kickass Secret Pal who is making my knitting life way easier. 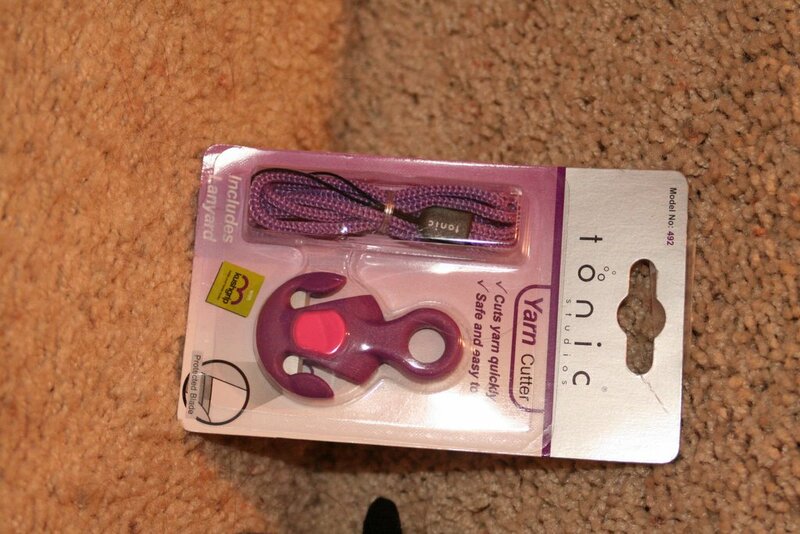 I received these two handy tools recently – a yarn cutter you wear around your neck and a cool little sheep tape measure! 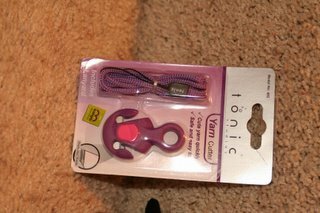 I haven’t opened the cutter yet (and apologies for the sideways pic) but I’m planning on bringing it to my knitting group on Sat. I always end up there looking for something to cut my yarn with – usually it’s a butter knife from the cafe so this will be a MUCH better alternative! 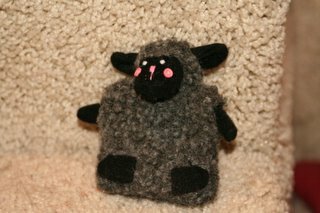 Also, I’m so excited that my little sheepy measure is black. I identify completely with the black sheep! Anyway, the kid is due 8/17 (the first day of classes, I might add!) Well-timed, eh? 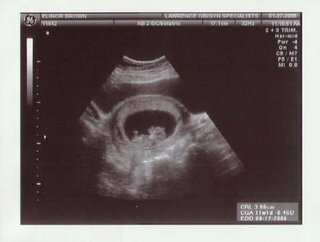 We aren’t going to find out if it’s a boy or girl – I am just content to know that there is only one in there! I wish I could say this means lots of baby knitting but until I feel better, there will be no knitting happening. Besides, I’m not so sure how I feel about knitting for my own kid. Isn’t that like counting the chickens before they’ve hatched??? Am I crazy? Opinions?? ?